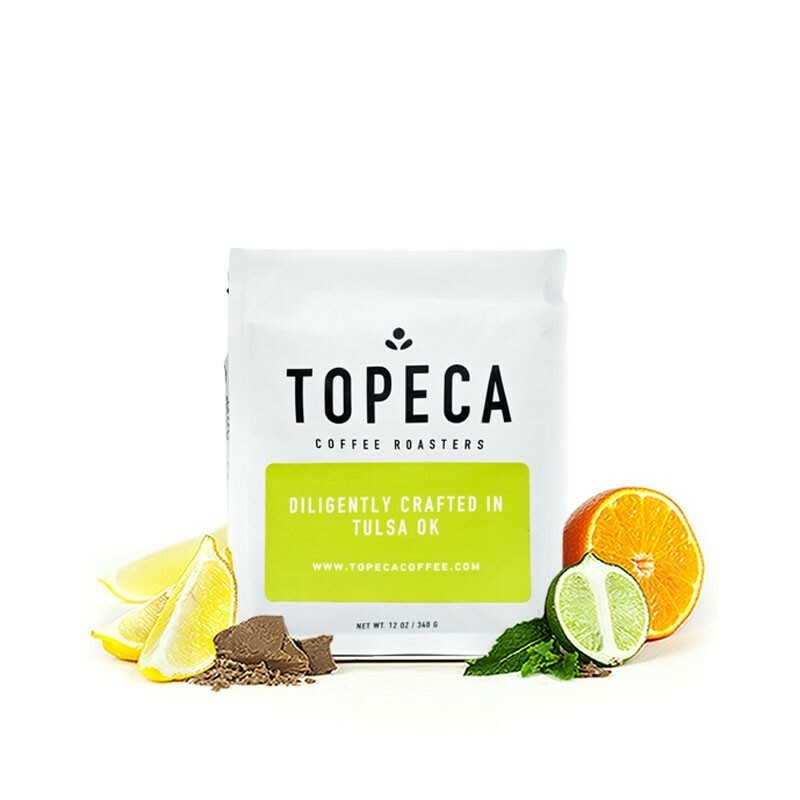 The El Salvador Santa Ana was carefully roasted for you by Topeca Coffee Roasters. The Santa Ana label is reserved for coffees grown at some of the highest lots of Finca el Manzano. These coffees coffee take longer to ripen and result in a cup with more complex acidity and floral aromas. This coffee has a sweet vanilla and caramel base, with a juicy acidity and floral aroma. Still getting used to the pour over technique and to the lighter roast. I'm finding this very accessible when properly dialed in. Very fruity and I guess, "juicy". I caught some jasmine aroma and lime flavor notes. A great afternoon pick-me-up. It was slightly bitter and too much citrus notes. Really enjoyed the citrus and floral notes. It was just a bit too acidic, though. Interestingly, it gets better as it starts to cool down. Decent, but nothing special. More earthy than citrus. It’s a great coffee given the comparisons of what is available in my town. Such as Noble Coffee or Case Coffee. More similar to Noble’s darker, floral notes than Case’s sour, citrus notes. That’s a good thing. Too light of a roast and it doesn’t seem like morning coffee. Balanced & flavorful. I liked its juiciness, though it was on the cusp of being too acidic for me. I like the aroma and flavor. It's a little on the thin/light side. This could be because I'm not using my regular filters this week. But overall I like it. I just started this bag today and I'm still working on a bag I got locally. Can we delay the next shipment for an additional week? Fruity and balanced. Really enjoyed this roast! Loved it! Great as a pour over. 3.5 stars. My favorite Central American coffees have a richer, thicker body but with notes of brightness balancing on top. This seemed a bit too delicate? This service will challenge me to increase my tasting vocabulary! Looking forward to more coffee! Awesome pick! I really loved this coffee in my chemex. I would say it had the floral notes and smoothness that I enjoy. My wife can even drink it black. Too weak, have to use quite a bit of extra grounds to make it taste just ok. It was great but tasted a little sour towards the end of the cup. Enjoyed a little less than our first. Seems to be acidic and dry. Our first coffe had such a round and full flavor. This one is a little harsher and bitter. Maybe it’s the caramel and dry chocolate notes. Seems to me like the floral notes don’t really come through. While still delicious, the round berry notes in our Ethiopia from Coava were preferable. I enjoyed how bright this coffee was. It was easy to dial into my machine. I selected this one on my own to try to step out of my comfort zone, and I regret it. The "juicy acidity" is just sour to me - it is a note that is really not for me. A tasty fall cup. Dried fruit/baking spice/toffee are the primary notes, revealing more stewed fruit on the mid-palate as it cools. Nicely balanced acidity and a dry coca-powder finish. Overall quite nice, if a bit subdued. Didn't quite get the fruit flavors as much as I'd like, not bad overall. Compared to the Verve Colombia Rio Blanco we thought this was less flavorful. The smell of the beans wasn't nearly as fragrant either. The beans are darker in color and not as "washed" so our expectation was something more robust. I think this should help narrow the direction for the 3rd shipment. Nice but not jaw dropping. Was hoping to be more fragrant. Delicious vanilla caramel notes. Mellow and smooth. Ordering again from the roaster to try this as cold brew. this one was ok - I think I like chocolatey/nutty better and maybe less acid/floral. Good, but seemed a little more fruity than the others. Was difficult to get real flavor I was looking for with various brew methods (v60, french press, american press, aero press). I am really enjoying this one. This feels more floral and light compared to the Anodyne. I enjoy the vanilla and dried apple note especially. No particular complaints, but I thought the flavors were too delicate. Very good. It was complex - sweet with a little bit of acidity. My wife liked it too. The coffee was very good because of the bright floral notes, and was very good as a straight espresso. I prefer the coffee to be a little richer, with some chocolate notes. The coffee became a little muted with the addition of steamed milk. Nice. But find this one a bit too acidic. Loved this one. Really great in the Chemex--the light, sweet taste was great. I like having these sometimes, to contrast the chocolatey ones (like the intelligentsia #1, which I also loved but tasted quite different). Certainly a good coffee. I appreciate that this shipment was much fresher than the previous. We like this coffee, but have received it so many times by now (in a little over a year of using Mistobox, probably 7 times) so we are ready for something new! Not much to this one, compared to others in category. Still good, but nothing stands out. It was good but it’s not my fav type of coffee. I would prefer a coffee with more berry, fruity, Bright, which this coffee was more subtle, chill, chocolatey. This was a decent light roast. I didn't really get any bloom when I used my pour-over Chemex. This was possibly one of the smoothest coffees I've had. However, with that came very little taste notes. I noticed a very low hint of citrus. I did not notice any other tasting notes. Did not enjoy this his at all. Almost no flavor. I tried a pour over, aero press, and French press. I tried various temperatures and brew lengths, but I just couldn’t make a good cup. Moderately bright + light. Minimal bloom growth and release of gases. I got my best flavor out of about a minute long bloom and a 15:1 ratio. Really enjoyed this. I wish I had more tasting notes, but I don't. I used it in a chemex and it tasted really nice. This is the sort of coffee that I love. I love anything with a bit of citrus that leaves a bright, interesting flavor lingering. What's even better- this coffee got BETTER as it cooled off. It was a unique experience drinking it when it was hot, then warm, then cold. So you could make a French Press or a big cup of this and enjoy it for hours. This is what I call a 'studio' coffee- great for sipping on when you're being artsy in the studio, even if that studio happens to currently be my dining room. It makes me feel much fancier than I actually am. Good, but not our favorite so far. Flavorful and rich. Enjoyed the aroma and lasting, rich flavor. I did not care for the floral notes when brewed at my standard brew strength of med to strong. When brewed weaker it was drinkable but not overly enjoyable. Very little aroma either from beans or brewed coffee. Didn't get any floral notes or brightness. Pretty boring. Of the variety pack in the first shipment, this was our favorite. Unfortunately, it was a month ago so I can't remember the specifics of what we liked! Very light and mellow - maybe a little too light, but really enjoyed it. I made this one with a french press instead of my usual chemex. Not as good as some others, but definitely a pleasant coffee. Nice coffee, but a bit too much on the light side for me. If you are a person who likes a smooth, caramelly, non-acidic coffee, this coffee is perfect for you. This was a decent cup. It wasn't a memorable experience, but all-in-all it was okay. Not quite the floral/fruity notes I am usually drawn to...which often leads me across the world too, coffee-wise! can definitely get the nice vanilla taste and very mellow. can also come across as a bit sour on some sips though. Not liking this one at all. Too light a roast and way too acidic for my taste - I can't get past the sourness to detect any of the "nutty" base whatsoever. I liked this one, very mellow but a good light cup of coffee. Love the caramel and vanilla flavor. Less bitter than the Corsica, a little lighter and more balanced. Bold roasty flavors, but lacked the smoky undertone I liked about the Corsica. Decent flavor, but lacking in fullness. I'm really pleased with this one. Even though it was lighter than I normally like, I liked the sweetness. This one was a bit too light and watery than I like. Excellent coffee. Sweet and nutty flavors and really unique. I loved this! Nice rich flavor but not overpowering or oily. Just ok. Too light for me. Better in an aero press than French press. A wonderful coffee, really fruity and complex. Good but too light or mild for me. I prefer a taste that is more robust. I thought this was a good light coffee, I liked the sweetness but thought it was just a touch too sweet. Liked this one a lot! It seemed warm and comforting, not really bitter or acidic. Coffee with good distinguishing features - very citrus forward, maybe overly so. This was tasty, but I don't gravitate towards the sweet-citrusy variety too often. Enjoyed the lightness of this roast as well as the hint of floral. Nicely balanced. Medium mouthfeel. Strong floral. Very good for floral lovers, but I'm not one of them! Went back for round 2, & while it's growing on me, I still prefer both the La Colombe Corsica Blend & the Anodyne Peru Cenfrocafe over it. Used with a french press and got a good, solid cup of coffee. I'm just starting to get into better coffee than what you can buy at Target/grocery store. My flavor profiling isn't even close to others so I didn't pick up any specific flavor notes, but both my wife and I enjoyed this coffee. Loved how smooth and sweet it was, however, a medium or darker roast would be better. Almost too delicate! Not bold enough for my taste. Surprising good. Vanilla and caramel not overpowering. I'm learning to enjoy the lighter roast. A bit more leather than I expected, yet quite smooth. Very light but taste wonderful. You definitely taste the caramel flavors. But a bit too light for me, but maybe good once in a while. Light. Smooth. Sweet. Very easy to drink. A little bright.Out of the four in this box, I rate it 2nd. I love this. It brews a delicious, flavorful cup of coffee that compliments any occasion . Another medium bodied and middle of the road flavor, at least to my taste. Much too mild and weak for my taste. Definitely mellow. Enjoyed the slight sweetness. Struggled with getting weak, flat pour over results. Better from Aeropress for me. Kind of flat flavor, didn't do much for me. A good light coffe for the afternoon. Starts with a hint of citrus and finishes strong with a smooth nutty/caramel flavor. Good coffee overall but prefer something with a little less citrus notes. This is the best, please send me more like this!! Lovely and nutty. Performed really well as espresso (great body and syrup) and as cold brew. LOVED the flavor on this coffee. Strong with subtle sweetness. Favorite single-origin in my sampler. Extremely well balanced, not too strong, and I loved the caramel and vanilla notes. Beautiful aftertaste. I had best results with the Aeropress. Inviting nutty aroma, nice sweetness and fruity flavor and finish. Was a bit delicate and fruity for my tastes, though going with a higher coffee:water ratio helped. Slightly sour notes. Light roast (not a fan). Flavor was really good! Very nutty, which I loved. But Would have wanted it to be a bit more bold and stronger. On its own it was light. When I put half and half the flavor would almost be translusent. Good cup of coffee, flavors blended well together. Seemed kind of weak though. Liked the distinctive bitter taste. I enjoyed this blend. A little different taste than my preferred. A bit dark for my tastes. This came as part of a trial pack, and like all of the other coffees in this pack, this one is old and has no coffee taste or smell. Not even when grinding in my burr grinder. Very mild, and a bit too mild for me, but true to form to what it's supposed to be and I enjoyed it for that. Good roast, not stellar. Out of the samples received, this was probably our favorite. Bland. I like my coffee mild, but this is just a step above drinking tea. Good, but not as good as the Anodyne. Has some odd notes. Not my favorite, but not bad. With is was a bit darker. Correctly noted as mellow. Did not have an overriding characteristic through a press, but was nicely balanced and sweet. Loved this! My favorite out of the samples! It's not a bad flavor, but very light in comparison to what we typically drink. We prefer bolder coffees, especially ones with a more robust and thicker flavor. Delicious, our favorite out of the sample pack so far. Lighter bodied with more complexity than the Corsica blend. Light roast, bright cup. Great aroma from pourover. Low acidity and very smooth. The nuttiness and caramel were fantastic. We love the flavor of this coffee, but it was difficult to dial in for espresso. This was a light, mellow coffee. I did not care for it. **edit. I made the grind more course and got a better brew time. The tasting note on the bag, "Mellow" really captures this one. I enjoy the taste - but not as my main coffee. More a late afternoon brew. Still 4 starts** Having trouble brewing this one. Need to coarsen the grind I think. A little sour. Defiantly a more tea like feel to it. Will make another cup with coarser grind to see if I can cut the brew time and get a better pour. The cup was easy to drink given its mellow character, however, it was a a little too mellow for me. I'd like a bit more complexity of flavor. My husband thought it tasted like it had cream in it, and I told him the profile mentioned caramel and vanilla, which ,add that comment abundantly clear. Would be great for some, but not stand out for us. I enjoyed this coffee a bit better than the Corsica Blend. Again, not a cup I could drink every day. Perhaps a bit too acidic for me. I have learned through this that I don't like the dark roasts as I did when I was younger. Excellent coffee. I love the light, slightly sweet/caramely flavor. Good but could be a little stronger for my taste. This coffee was ok, not as good as the Corsica blend which I liked best so far. It was still a little weak for my liking. Not my favorite, but I still liked it. I was pleasantly surprised by this one on two counts, as I normally prefer darker roasted coffees and blends over single origins. Very flavorful. This was my favorite of the first 4. I wanted to love it, but I thought it was just okay. I was really excited to try this coffee but it was really weak and barely tasted like anything. Delicious cup. Goes great with milk. excellent coffee! citrus after-notes make this one of my favorites. Smooth cup. Starts sweet and floral and finishes at the back of your palate rich and earthy. I brewed it a little stronger than usual for my tastes. A sweet, mellow but also well balanced coffee. This was a clean tasting coffee. Great for an afternoon pick me up. My favorite in the discovery box, the caramel flavor really came out and played well with the almond milk creamer I use. I thoroughly enjoyed this coffee. Very flavorful. Smells good, nice mellow flavor. Too light and bright for my taste. Tasted weaker than the others in my discovery box. Was somewhat better as iced coffee (cold brew), but still not for me. Nice bold flavor. Not decaf as ordered so I could not drink it. I brewed this twice - once at 33g per 4c, and again at 28g per 4c. I preferred the lighter cup. The coffee in both brews was mellow, but flat and uninspiring. Too dark of a roast. I do not pick up any sweetness, only caramel and smoke. Good, but very very light -- a bit too tea-like, and the fruit-y nose was a bit unexpected. Very easy to drink black though, so a good backup for when we run out of milk! Lighter than I usually drink, but with a smooth, nice flavor. Because it was a lighter roast than the espresso roast I like, I used more than normal amount of beans. Still the coffee was weak, but seemed crisp or tart. I didn't taste the sweetness of caramel or vanilla, which I was looking forward to and would have been delightful. Instead, it seemed to have a somewhat sharp edge, maybe kind of citrus?! This was alright. The flavor was not deep, but was mellow and very easy to drink (I maxed at 2 Tbs of coffee). I really like this for a light roast. I thought that the nutty/woody/leathery taste was really good. I think that I brewed it too light but I still got the flavors. I liked the low acidic sensation. I would like explore more of the lighter roasts. Loved this for its mellow feel and caramel taste. Not enough coffee flavor. Brews weak. Too much coffee and les water makes for a bitter taste. This one was just ok. Kind of bland. While I do like the overall flavor (a touch of floral/citrus with a bit of oak), this is a bit on the weak side for me. All in all, it is a pleasant cup of coffee. Probably best at night, with a dessert. This coffee tasted good, but it just felt too plain and was a little bit sweet for my taste. I made this a little stronger than usual. The result was a weak version of Dunkin Donuts regular. (Actually, DD bean coffee is pretty good, but the Indian immigrants who run all the DD shops around Philadelphia tend to brew it weak.) I dumped the rest of the sample pack in with my regular beans. Nice smooth coffee. Very good with a cookie or just to relax. Too mellow for me. I would never purchase it. Light, citrus, a bit sweet, mellow finish. Our favorite coffee so far! Not much taste here unless you like mild tasting coffee. It wasn't bad at all, which I understand is a strange thing to say with the one-star rating, but it was just not to my taste. Too light and lacked some complexity for me. Very pleasant and enjoyable taste. Not dark enough or acidic enough for us. Very different taste. I enjoyed the flavor but would not drink every morning. I was expecting more sweetness and floral taste in this coffee, but it seems the nutty side dominte in my cup. My bag came in part of the discovery box, that might explain why it did not smell as fresh as it should have been. Good coffee but light flavor. Definitely more of a preference-could appreciate it though. Brewed over a V60-02. Good acidity and mild flavors for me. Citrus and floral notes present; quite pleasant when brewed with any paper filter pour over. Favorite of discovery box. Was really hoping for some more flavor though. I do prefer the lighter roasts that can showcase fruity, sweet, and floral notes. Did as french press and V60. Never got great flavor out of V60 (might have underextracted), but enjoyed carmel afternotes in French press. Good, and one I would drink, but, to me, not quite as solid as the rest. Smooth, but too sweet for me. Too acidic and tasted citrusy (which I dislike). this is the best one, i loved it. Very light, tea-like taste, but very flavorful. Floral like taste. Enjoyed it quite a bit, but more for a coffee to enjoy every once in a while. Not strong enough for me for every day, but enjoyed it quite a bit. 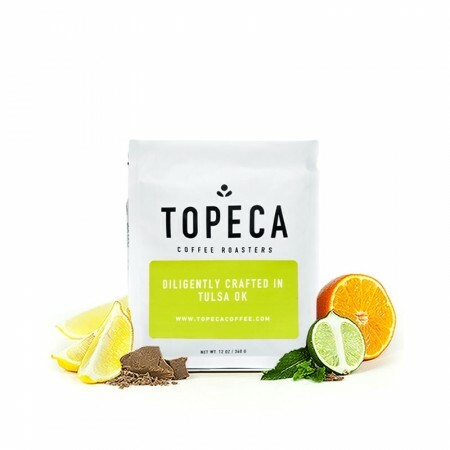 This is my first coffee from Topeca and it was fabulous. Of the four coffees in my Discovery Box it was by far my favorite. When I brewed up a cup my Wife asked if I was was using vanilla-that's how wonderful the flavor notes popped. Awesome stuff. Enjoyed the lightness of this coffee. Great for the afternoon. Enjoyed the single origin background as well. Good cup - light body/mouthfeel, with high citrus notes. Enjoyed the flavor, but was too light. Kinda felt watered down. Far too nutty for me, but I don't usually like light roasts so that's not surprising. 2.5 stars. This coffee had great potential but ended up being more flat that I expected. The flavors were too light and subtle for what I want in coffee, though I liked the sweet, almost creamy taste. I thought this one was really unique and I enjoyed it quite a bit as well. This was a good, sweeter coffee. I prefer more of a medium roast, but it was still quite enjoyable. not sure the floral/citrus notes were for me. don't want to write it off, but i'm skeptical. This had a slightly sweet aroma and a light appearance so I was apprehensive about it at first but I thoroughly enjoyed it. I would still say this complements a delicious dessert more than as an anytime cup. This had such an interesting array of flavors. I loved this coffee! Delicious! Bright, nutty and aromatic! A very complex coffee with notes of nuts, caramel, and vanilla. It is a very light coffee, even in the Kalita Wave it kept very light on the pallet. A fantastic coffee. Sour to the point of being almost unfinishable. Sorry, but this was disturbingly earthy. Love the balance of acidity to the nutty, caramel notes. Very mellow and comforting. Really enjoyed this coffee, had a great citrus flavour and a delightful vanilla-like aftertaste. Was excited for the caramel mentioned in the tasting notes, but didn't come across. Also left a bitter aftertaste. Strangely, we found this light roast coffee more in line with our darker taste preferences than the Anodyne. Comparing the two, we liked the Santa Ana's nuttiness and assertive, yet smooth, start to finish, as opposed to the almost harsh tanginess of the Anodyne. Still not our favorite, though, as we prefer richer, yet distinctive, roasts. A lighter roast than what I tend to gravitate towards, the description fits the taste well. Not a pleasant beginning note on the coffee. Subsequent sips are better but slightly acidic. I loved every single sip of this coffee! It was so comforting mellow. Decent, inoffensive. Good for Sunday mornings. Molasses towards the end. Don't care for taste. Has an earthly or muddy taste. Iliked this one alot. Had some great flavors. I usually don't love lighter roasts but this was certainly an exceptions. Very good, probably the best in the batch. I always hope for really overpowering flavors that wake you up. The flavors in this coffee were too mellow and left a weird aftertaste that I didn't like. I did not like this one. Strange and nutty and a very weird flavor and aftertaste. Really did not like. Loved the sweeter flavors that come out of this one! The only problem is I think this light of a roast was a lot harder to grind with my hand grinder, not sure if thats always the case with light roasts, this is definitely the lightest I've tried! Very nice! Delicious, mellow; subtle. Coffee without bitterness. We did not enjoy this coffee through french press and Aeropress. It was sour to us. Smooth, hint of a nutty flavor. Liked the mild hint of vanilla. I really like the nutty notes in this that are well balanced with some slight citrus zest and chocolatey tones. It's not too roasty and bitter, but it also has those notes that I enjoy as well. A little too light for me. Perhaps I could enjoy this with more experience drinking it, but I found it's flavors a little too much on the subtle side, a bit watery. Not a fan of nutty flavored coffees, this bean is not for me. This coffee had a great 'nose' to it as I was drinking it that really surprised me. While I liked the complex nature of the smell and taste, it was not quite bold enough for me to drink on a regular basis. I like it a little better then the Peru Cenfrocafe. Very smooth. Excellent in the french press. Nice blend, but my preference is for a darker roast. Way too light and acidic for my tastes. Wasn't really bold enough for me, too light, I prefer La Colombe . Light roast, decent flavor but not strong bodied. Good for a single source roast but not my favorite. I liked the hint of vanilla and found it o be very enjoyable. This coffee was to mild for my tastes. It just did not have any personality. Too light, too mellow, and too acidic for me. We made this pour over this morning with the kalita wave. I brewed with 450 grams water to 30 g of coffee grounds. Some of the flavor notes came through, but it tasted like a dark roast coffee, a little more acidic than what I'm used to. Im going to try this again tomorrow with a different ratio. i tasted some caramel and a tiny bit of vanilla, but it was very smoky. Our new favorite so far from MistoBox! Just enough sweetness to compliment the overall rich taste of the coffee. Once again, the MistoBox description was spot on. Interesting flavor...not sure if I like it. I really enjoyed this! Nice, smooth, and the notes were really present! Great coffee. Liked the overall brightness of this bean. Very Light an Mellow, to much so for me. I did taste notes of vanilla an a very faint hint of caramel, but it vanished fast. Not much body to it (I like coffee with an without a full body). It had a good clean finish which i did enjoy, And the Acidity is fine, not to much or to little but i can handle most levels of acidity with no problem. Anything you add to this coffee such as milk,creamer an certain sweetener's, Will overpower the real flavors of the coffee. Granted there's not much flavor to begin with. Overall i give it a 2 because its just way to mellow an light. To much so for me. Mild, nice after dinner coffee, probably nice with something sweet to eat. Way too light for my taste. This coffee has the intense flavor I love of a single-bean with the smoothness of a blend thanks to the same source double-bean blend. Milk chocolate and floral. I did not expect to like this and I LOVED it. It had a nice flavor, but it was a bit too mellow. It wasn't bad. It was a very bright cup of coffee with a nice finish. Might have been my mood, as I may have simply wanted something darker at the time. Will update if my opinion changes when I use the other half of the beans. A little too mellow for my taste. Almost tea-like. Love this coffee. Fruity, acidic, and complex (meaning some other flavors, I can't quite describe). Reserving 5-stars for perfection; this would be a 4.5 for me. I liked the initial flavor, but not the aftertaste. Overall, it was a bit light and a little to acidic for me. ok - a bit light. I wouldn't buy it. Light to medium roast.Fruity but little body, clean finish. Weak as water, added flavors overpower the cup such that one cannot taste the coffee. Too light. Couldn't get a good taste out of it. Better than the Cenfrocafe, but not attractive. Lacks richness. OK for a light roast. A little sour. Nice roast not too light, but not too dark. I'm really starting to HATE dark roasted coffee. It does seem a bit light on the body when brewed as compared to others. I really like the nuttiness and hint of sweetness. It was so pleasantly mild with hints of vanilla! I a darker roast, but the sweetness of this blend was appealing. Really nice! Very mellow, but not too light. Nice flavored, very easy to drink. Wanted to give this 3.5, but wasn't offered the half-star rating option. This was my favorite of the introductory four coffees. The flavors here seemed to come closest to those typical of the East Africans I tend to favor. This came out with nice acidic notes both from pour-over and Aeropress. This one is really good. Very good taste! I like this coffee - it's not my favorite compared to the Corsica Blend, but it's up there. Since this is a little lighter, I could see myself enjoying switching it up every now and then and working this in along with a darker roast. Bright and refreshing, vibrant. Smelled strong, almost sweet, but had a nice mellow flavor. Great for sipping in the evening after work. Very mild in a pleasant way. A bit too light for my taste but I like how flavorful it is. I really enjoy this roast. It's very rich with a citrus after taste and caramel​ body. It didn't smell as good as the Peruvian, but still pretty good. the acidity lends it self to an alkaline flavor that is too aggressive, the blend to me is a little confusing on the tongue. Loved this coffee. One of my all time favorites. Probably our favorite out of the discovery box, the notes of vanilla and bourbon shine through nicely and the aroma is pleasant. A little less complex toward the finish than we like. For a lighter coffee, I enjoyed this cup. Very nutty, hoppy/malty with hints of vanilla and caramel. Very light body. Although it was light, I really enjoyed the caramel and vanilla flavors. Good cofee, too light for my taste, I do not like vanilla. This was a delicious, smooth coffee that seemed to have a higher caffeine content than others. It was a little on the light side but overall enjoyable. Very smooth and creamy with strong notes of vanilla and caramel. At home we generally make espresso but this would be wonderful to take with us when we pack our Aeropress for camping. i had such high hopes for this one, but it just doesn't have much flavor. light roasts typically pack more of a flavor punch than this coffee. very nice flavor, excellent aroma, could taste the slight hint of vanilla. Far too light for our taste. Doesn't make a good espresso; too mellow and little taste. For a VERY light coffee, this is delicious and smooth. Very Mild, a bit too mild. But, very drinkable and smooth. This was a very pleasant smooth cup of coffee. Didn't like the fruity undertones. Liked the caramel note. In general, smooth, easy to drink light roast with hints of sweetness / caramel. As a PRESS, the "citrus" (I call it sour) acidity is very strong, and stronger still when adding milk and sugar. As a POUROVER, what you gain in getting the taste of a medium roast, you lose in the nuances of the caramel and it becomes an uninteresting cup of plain coffee; and M&S won't save it. As a COLD BREW, it blossoms into a beautiful caramel light roast with only a hint of sour. I personally do not like "sour" coffees (thus gave it 2 Stars since Mistobox doesn't differentiate between my objective and subjective taste preferences) , but if I did, this could be the ticket (and I'd give it 4 Stars). This had a very good tasting, complex blend of flavors. Really good. Very nice cup. Big fan of the light roast with bright acidity. Would definitely buy this again. Great coffee - tasting notes were excellent and more up my alley, but the coffee overall was a little light for my liking. Wish these flavors would would have shown through a little more boldly with more of a mouthfeel! Good coffe, would buy again! Nice caramel hints with an even smooth finish. The lightness of this roast took some getting used to, as the coffee, even espresso, came out almost tea-like. Really enjoyed this roast. Very smooth and light. Flavorful, but clam. I liked it. Think this one hit the spot! I really thought I was going to enjoy the Mocha Java Blend the best but I think this one stole the show! Overall was a very smooth and balanced roast. I like that it is a single origin roast. If it says anything about the roast, I finished this bag first! I expected to like this bean but I didn’t expect to like it as much as I did. It smelled like Apples and honey. A bit of caramel. The vanilla notes in the flavor were prominent. There was a pleasant tartness. A very light and delicious roast. Bitter and weak. Not something that I would ever buy. Light and not as much flavor as we like. Slightly bolder aftertaste, but overall a smooth and mellow coffee. Can taste a hint of caramel. The aroma is a little deceiving though - thought it would be on the slightly bitter side, but that wasn't the case at all! Not bad, but not one we would like to receive again. Pretty yummy, very smooth. Somewhat similar to the Peru but we liked the Peru better so this one got a 3. :) Good light coffee; I think we like a little more deepness less floral. favor is more to our liking. Very light and weak body. Missing robustness. This was probably my favorite and really enjoyed the coffee notes that were described. Second best of the four. Out of the four that I received this one was my favorite. I liked the light and bright flavore that the bean provided. I liked it, but not as much as the Peru Cenfrocafe. I felt that it was very acidic. Not to my liking. I prefer a dark roast and I'm not a fan of vanilla. This was okay, but very mild. Minimal roastiness and very light on the palate. Good. I liked the fruityness but I feel like it could have been a bit more acidic or brighter. I would like to try to brew a cup from here again. Strong and chocolaty; full in body. Definitely a good, Central American cup. Fantastic. Smooth with an excellent flavor. A light bodied coffee, taste is passable, but not the rich fullness that we like. Really enjoying this one...nice and mellow. But after making a 2nd cup, I've decided it's a little too mellow for me. Light, almost not flavor. Mild. Clean finish. Hints of vanilla. A solid morning coffee. Ultimately falls a little flat.. looking for something more engaging. The light notes and bitter undertones make for a pleasurable coffee experience. I couldn't give it a full 5/5 rating because while it was good. . . it wasn't too good. Mellow, sweet and nutty is the perfect description of this blend. Loved the quality of the roast and the warm, chocolate, nutty flavor. My second favorite from the sampler. I liked the acidity and the subtlety of the flavors. A coffee I could drink a lot of. The roast is a bit lighter than I prefer, but the coffee has a lovely flavor and perfect balance of acidity. This coffee is VERY LIGHT in taste... as in, almost nothing.I could see this being an all-day drink, even served cold/iced.I did not like this, but can appreciate its attributes. Like it the best of the 4. Very good! I like that there's no fruitiness in the flavor. These are great as a light roast bean! Probably my favorite in the box. It's a light and crisp taste. The taste was overpowering- I've found I don't enjoy lighter beans. If I try a lighter bean again I'll make sure to use a coffee press instead of a drip over to see if that improves taste for me. I really enjoy this one. It does have a bit of a spunky linger, but it is very good. Overly acidity and too light. Ok flavor bit couldn't finish the cup. Delicious and mild. No bitterness but I would prefer more flavor and complexity. I know a lot of people who like coffee like this, but it isn't my perfect cup. Its more acidic than I prefer, and needs sugar and cream, while I prefer coffee that is okay with just cream. It isn't nutty enough, and has more bite. Its almost sour, if I had to put my finger on it. I'm sure its a coffee for some people, and it isn't BAD. Its just not for me. Delicious, sweet, very pleasant cup. Also a hit with my girlfriend, who normally doesn't taste much difference in coffee. Very mild and mellow with floral and caramel aromas. Very good example of roasting and blending to achieve the utmost from the particular varietals. First note is moderately interesting. Aftertaste is much like diner coffee that has been sitting around. A very good coffee. I little more acidic than Anodyne's Peru Cenfrocafe, and not as full flavored, but still very tasty. Maybe too mellow.. Lots of caramel when brewed on the espresso machine. Even more mellow on the moka pot, but comforting when brewed that way. Can drink it all day, but not blown away. It's super smooth and flavorful. It works really well with sweet cream, and I would drink it any time of day. Tasty, but a little flat in complexity for my preferences. Well roasted and balanced but a bit less exiting than I would have liked. Like this very much. This was my first trial of coffee looking forward to my next coffee adventure. This is a very good coffee. Certainly above average. However it was my least favorite out of my sample box. This is exactly the kind of coffee I like. I do pour over method- both Chemex and Kalita Wave. Nutty. Medium bitterness yet balance and aromatic. Surprisingly okay, but I prefer coffee that isn't this bright and acidic. I really wanted to like this one based on all the info provided. I've had beans from El Salvador before and been blown away by how intricate and nuanced the flavors and aromas are. A couple favorites are from Four Barrel and Blue Bottle. This one was good. Very delicate milky caramel notes. With traces of tamarind. The nose was floral and faintly reminiscent of a homemade custard. I appreciate it for what it is, but wouldn't get it again. Not bad, but also not very exciting. No off flavors. Everything was very muted, so I'm guessing I didn't get very fresh coffee. So far - our favorite coffee with a mellow and nutty taste. Okay. Very mild. I prefer a bolder coffee taste. I liked the fruity, sweet taste of this coffee. Was very weak. My wife said "This just tastes like hot water". I did a finer grind the next day, and it was a little better, but still wasn't getting much flavor of anything. Rancid. Worst El Salvador I've had. Multiple attempts to dial in the brewing process via Chemex all led to a cup that had great aroma - but was extremely sour on the front and the back, with an offputting, lingering astringent aftertaste. It's so bad that I'm still wondering if it was my brewing process, but I've had El Salvador Santa Ana beans before that have been fantastic. This was just a complete drain pour. Lovely coffee. Light, simple, easy to drink. Went great as both a macchiato and cappuccino. Nice caramel finish. I did not care much for this. It's too sweet. It definitely has a nutty taste and a floral after-note. I'm not typically a fan of my coffee tasting like flowers, but this was implemented well. Tastes good, but taste could stand out a bit more. I think there is a little fruitiness that would be nice if stronger. Smooth with no bite. btw--I used to work in the building where their shop is and drank a lot of their coffee! I loved this coffee. It was light but also complex in flavor. I normally only have 1 cup of coffee in the morning but I had to go and brew another because it was so tasty. Good flavor. A little light (the roast) but still pretty good. Strong after taste. But not a really strong coffee taste. This coffee was fantastic, one of my favorites so far this year. I loved it through v60 and aeropress. This coffee was way to light and bland. Very boring and basic. Fruity with a rich but reserved 'toasted honey' taste. A nicely nuanced light roast.